The three warriors picks up one Keyblade each. The warriors look to the distance, noticing the approaching figure. The video starts with the view of a desert. Semi-transparent Ansem's Reports scroll down the screen where one of them explains a detailed article on the Keyblade. There are a few shots of metal objects lying in the sand. The screen shows a man in armor, Terra, standing amidst the desert waste, on the remains of a large construct decorated with various spikes. He looks to one side and sees another armored figure, Aqua, approaching. Terra turns his head again and sees the third figure, Ventus, also approaching. As Aqua and Ventus come closer, Terra walks towards three Keyblades standing alone in the wasteland, as the thing he was standing on dissipates in the same fashion as a dying Nobody. The three Keyblades are the Kingdom Key, the Way to the Dawn, and the Kingdom Key D. Terra takes the Kingdom Key, Ventus takes the Way to the Dawn, and Aqua takes the Kingdom Key D.
"Master of Keyblade" could refer to Xehanort, Eraqus, or possibly the Mark of Mastery exam. It could possibly even refer to Aqua, who becomes a Keyblade Master after passing her Mark of Mastery exam during Kingdom Hearts Birth by Sleep. "The lost two" likely refers to Master Xehanort and Vanitas, or Ventus and Terra. It could also mean Ventus and Aqua, since Terra's body has been seen throughout the series, but neither of them had been seen before this. "Memory of Xehanort" refers to the memories that Xehanort lost when he developed amnesia. Nomura has explained that these are related to the reason that Sora and Roxas can dual-wield, and why Roxas seems to have a heart. "Chasers" could refer to Terra, Aqua, and Ven, who are chasing Master Xehanort and Vanitas. It is possible that "Chaser" is a rank, as well, as in the real world, "chaser" refers to one who engraves metal. "Keyblade War" refers to an ancient war fought between Keyblade wielders. "Birth by sleep" refers to how everything is "born through sleep". It may refer to the Dive to the War of new Keyblade masters. 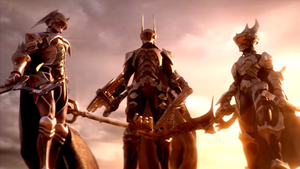 Prior to the release of Kingdom Hearts II Final Mix, which featured "Birth by Sleep", a secret video continuing "The Gathering", there was heavy speculation as to the identities of the three armored figures. Once it was released, Nomura revealed the identities of Terra, Ventus, and Aqua, noting that they had a connection to Sora, Riku, Kairi and Xehanort, though he refused to specify to avoid spoiling plot points. This scene ultimately occurs in Kingdom Hearts Birth by Sleep ten years before the events of Kingdom Hearts, where it is followed by a vicious battle between the three warriors and Master Xehanort and Vanitas. "The Gathering" was conceptual. The actual meeting in the Keyblade Graveyard of Terra, Ventus, and Aqua does not feature the three armored. Nomura has said that they were depicted as such in "The Gathering" because he did not have final designs worked out for any of them. Additionally, Terra does not stand on a vanishing metal structure, nor do any of the three Keyblade wielders pick up Keyblades associated with Sora, Riku, or Mickey. The previously known Keyblades they picked up hinted at their fates at the end of Kingdom Hearts Birth by Sleep: Terra picks up Sora's Kingdom Key, a Keyblade from the Realm of Light, symbolic of Terra remaining in the realm. Ventus picks up Riku's Way to the Dawn, symbolic of his half light/half dark nature in balance with Vanitas, the fact that the two become one being again, and that he eventually rests within the Realm Between, in Castle Oblivion. Aqua picks up Mickey's Kingdom Key D, a Keyblade from the Realm of Darkness, symbolic of Aqua trapped in the Dark World. ↑ Another side, Another story... "A world between = A forgotten world. The Gathering." This page was last edited on 22 March 2019, at 20:54.